For a quick startup of how to print bar codes with TEC-IT barcode activeX software we provide you with various bar coding sample applications. If there are any questions, our support team will provide you with additional sample code (Visual Basic, Microsoft Access, Delphi, C/C++, ASP, PHP and more!) and assist you until you have finished your bar code application. Check out the sample applications in the software download-area. Check out the sample applications (Access,...) in the software download-area. First install TEC-IT barcode activeX software (from our Download area). Here is the Link to our Free Barcode Software Download Area from where you can get all software: Click here! Keep in mind: by using TEC-IT's Barcode ActiveX Software you can create bar codes without unwieldy, inflexible barcode fonts and without expensive bar code printers or hardware extensions. You can print bar codes on every printer (Laser, Inkjet, Matrix...). To get optimum results and print the bar codes as you need them, you can adjust various bar code parameters. They are preset to common and best fitting values for flawless handling and use, but you can change them all if you need. By using the ActiveX software instead of barcode fonts or bar code printers you are much more flexible in adjusting the bar code parameters to your application as you were with fonts or anything else. The enhanced WEB-API of TEC-IT's bar code activeX software enables you to create bar codes using the activeX technology on a web server (IIS). Therefore you can implement bar codes into HTML documents without any client installations. 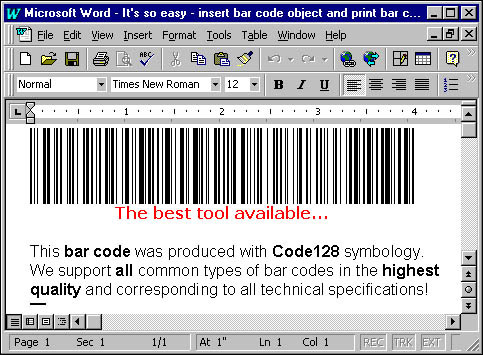 TEC-IT bar code activeX for ASP and PHP-4 is very easy to use - simply include <IMG> HTML tags into your web page and get bar codes into the browser window. The barcode is created dynamically as an image (PNG, JPG,...) and sent to the client's browser as bitmap data stream. By using the ConvertToStream method the barcode is created without the need of saving it to a file. Therefore time consuming resource cleanup won't be necessary - it's very fast and needs only few system resources. Sample code for ASP and PHP is provided (it's much easier as you might think!). Please keep in mind: using TBarCode activeX software is installed on the server and enables browser independent bar coding. You don't need additional bar code software on your clients (no barcode fonts and no bar code printers).